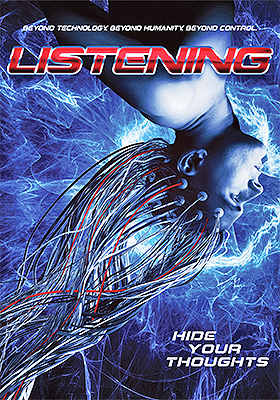 MVD Entertainment Group will be guiding the Listen Films, LLC production of writer/director of Khalil Sullins’ Listening to the DVD market place on July 26. If they had two nickels to rub together, David (Thomas Stroppel — The Falls: Testament of Love, Bucksville) and Ryan (Artie Ahr — Immigrant) would be richer by ten cents. They are flat broke, their personal lives are in disarray, but they think — no, make that, they know — that they might just have the next BIG thing. David and his best buddy, Ryan, are life-long friends and grad students at Cal Tech, who have pilfered enough equipment to land them in jail on felony charges and have spirited said loot away to David’s garage so that they can conduct research on mind control; mental telepathy. As the film begins, this little experiment is in something of a “feedback” loop in that they can’t quite get it right. A fellow student named Jordan (Amber Marie Bollinger) gets wind of their secret and joins in … and that’s when things get interesting. There’s a spark and they are able to move to the next level. Now, if the trio would have bought a DVD copy of director Joel Schumacher’s 1990 film, Flatliners, and watched it, a lesson might have been learned that would have saved them — and those close to them — a lot of trouble and pain. But then Sullins — and this is his debut as a filmmaker — wouldn’t have much of a story to tell. Once the trio, and in particular David, have their breakthrough and are able to first read another’s thoughts — there’s a fun bit involving David and his wife, Melanie (Christine Haeberman) — and then engage in actual brain/thought manipulation, things for them go downhill quickly. We, as viewers, are privy to a little piece of information that David, Ryan and Jordan are not. It seems that a secret government agency is working along the same lines, but with less than successful results (albeit deadly). Once Matthews (Steve Hanks), the titular head of this clandestine “research group,” tumbles to the David’s success it is just a matter of time before their world’s collide. Writer/director Khalil Sullins has delivered a solid sci-fi thriller, with special kudos to cinematographer Blake McClure (who won the ACE Award for his work on the television series, Drunk History), who brings his skill set to Listening and elevates the end product well beyond the indie micro-budget sphere. In short, Listening, is slick, well-produced, blessed with a solid story and has a great third act that will satisfy all. 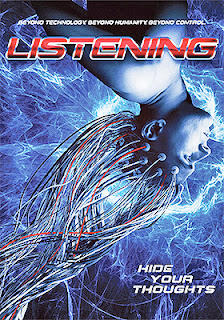 Don’t be surprised if a studio executive picks up a copy of Listening on July 26 and sees the potential of remaking this little gem as a major studio production (think: Kevin Bacon as Matthews)! 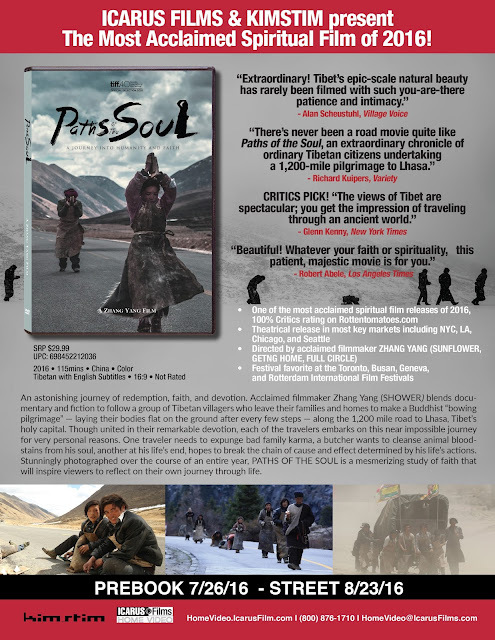 But the “journey” that award-winning filmmaker Zhang Yang chronicles in Paths of the Soul is one that is both breathtaking and at first difficult to fully understand. The KimStim Collection, with sales and distribution support provided by Icarus Films, will be bringing this film festival favorite to the domestic DVD market place on Aug. 23. A limited arthouse theatrical run yields an ARR of 102 days. Zhang Yang, whose films include Shower, Getting Home and Full Circle, takes us on a magical journey — one that is actually based on the annual Buddhist “bowing pilgrimage” to Lhasa, Tibet — with a disparate group of villagers. Each has their own reason for undertaking a 1,200-mile journey that requires them to stop every eight steps and completely prostrate themselves on the ground. You read that right, every eight steps! Each of the travelers has wooden hand guards and is decked out in a leather apron, otherwise the constant stopping, kneeling and bowing would render their hands, knees, elbows, etc. a bloody mess. They trudge along at six miles per day. When the money runs out, they stop — as a group — and work. If one of their members becomes ill, they stop and wait for that person to heal. It doesn’t matter if the delay is for a day or a week, they wait … and then return to the pilgrimage. The journey, in a very real sense, cleanses the soul. Each member leaves the world they knew behind them and puts their entire focus into eight steps, bow, eight steps, bow … and all the while chanting and clacking their hand blocks together in rhythmic fashion. This is Tibet and the landscapes are specular; the weather can be unforgiving and yet our pilgrims journey on. Paths of the Soul is a “road trip” that is well-worth taking as we come to know each member of the troupe; share in their quest … one that seems so odd at first and yet ultimately is rewarding on so many levels. 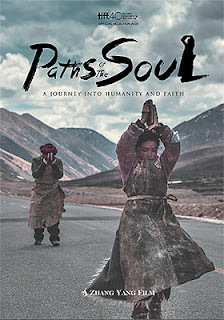 Paths of the Soul is presented in Tibetan with English subtitles. 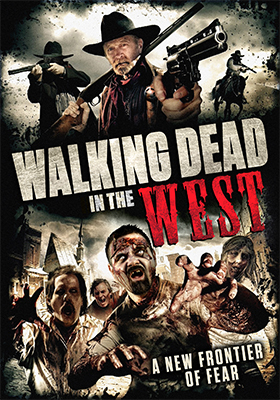 Wild Eye Releasing has selected Aug. 30 as the DVD debut date for writer/director Paul Winters’ Walking Dead in the West, a mixed genre thriller that will not only please horror affectionados, but those who enjoy Westerns as well. The first impression for any indie film is almost certainly related to production values. If you’ve seen you share of indie films — which always means films with limited budgets — did the filmmaker(s) get the technical aspects right? Acting, plot, direction all succeed or fail on their own, but if the film looks like crap (i.e. an ill-conceived student film project) the greatest plot, with Oscar-winning actors and director, no matter their talent, are doomed to failure. 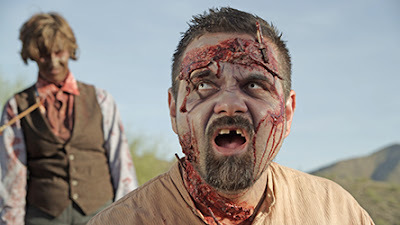 So when you settle in to watch a Western and a zombie flick as an all-in-one experience, it better be technically sound otherwise it is a no-go from the get-go. Paul Winters (Nate and the Colonel, The Homecoming of Jimmy Whitecloud) and his cinematographer Adam R. Cook (his first feature film) absolutely nail it. Walking Dead in the West is gorgeous, so grab the pop corn and enjoy. It is the famed Arizona Territory of the O.K. Corral, the Earps, Apaches … it’s the Wild West; the untamed frontier. There is just one little thing amiss, the dead are on the prowl — a traditional Western would have cowboys and soldiers fighting off marauding Indians, but they too have to put their differences aside and join in the fight (think: survival) against a common enemy. U.S. Marshal Frank Wilcox (Paul Winters) has to assemble the survivors of the town of Crumpit into a fighting force to defeat the zombie hoard. It’s all about trust — and, yes, survival — as a Buffalo Soldier, Sergeant Bale (Calion Maston) teams with an Apache Chief (Lee Whitestar), a crazed preacher (Greg Bronson) has to take up a gun, a saloon owner — the lovely Rose Ann (played by Sandy Penny) — and the Marshall’s own prisoner (Jarod Anderson) have to put the things that have set the apart aside. It won’t be easy as trust can be hard to come by! So mark Aug. 30 on your must-see calendar — Western, zombie, horror — as those are three great reasons to check out Walking Dead in the West. 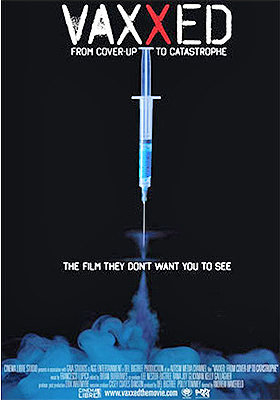 Cinema Libre announced this past week that medical researcher-turned-documentary filmmaker Dr. Andrew Wakefield’s controversial exposé on autism and the MMR vaccine, Vaxxed: From Cover-Up to Catastrophe, will be released on DVD this coming Sept. 13. Wakefield, who initially reported on a potential link back in 1998 — and was subsequently attacked for his findings — hooked up with CDC whistleblower, Dr. William Thompson, who claims that the CDC deliberately destroyed and/or altered data that confirmed Wakefield’s initial findings? But why … why would the CDC engage in this cover up? This is the stuff of spy thrillers! Unless you are a mathematician, it is entirely possible that you’ve made it this far in your life without the words “Srinivasa Ramanujan” crossing your lips. Paramount Home Media announced this past week that writer/director Matt Brown’s film adaptation of Kanigel’s book, The Man Who Knew Infinity, will be making its DVD debut on Aug. 23. The ARR works out to 116 days and domestic ticket sales for this IFC Films theatrical release (limited to under 300 screens) currently stands at $3.5 million. 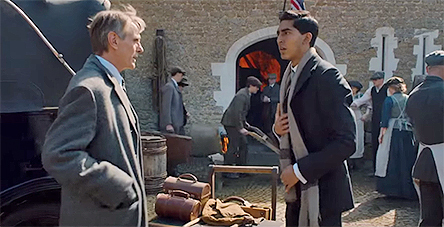 Ramanujan was born to a family of limited means in Erode, India in 1887. His siblings all died in infancy and by all accounts he too was a sickly child, but by the age of 11 it was apparent to his teachers that he had a special gift for mathematics. By the age of 16 he was a self-taught mathematician working on the cutting edge … we’re talking string-theory cutting edge mathematics! A self-taught 16-year old, think about it!!! 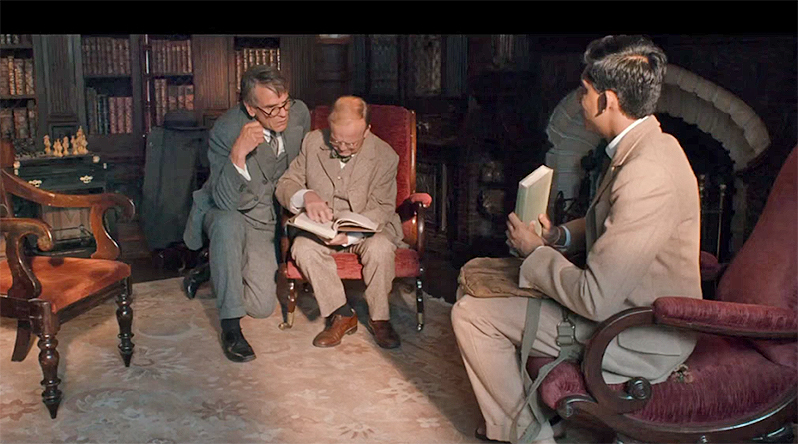 So here you have a genius, living in British Empire India and his teachers are fully aware of his gift. That can only mean one thing … jolly ole’ England and that is the focus of filmmaker Matt Brown’s film as Ramanujan (played by Dev Patel), after a five-year effort — delayed both by his very orthodox mother and the fact that a number of famous mathematicians in England at the time simply could not understand how far out there he was — comes to Cambridge. Once there he is mentored by Godfrey Harold "G. H." Hardy (Jeremy Irons), a cutting edge mathematician in his own right, who did recognize just how “out there” Ramanujan was. Their relationship — real opposites — is the focus of the film and it works like a charm. 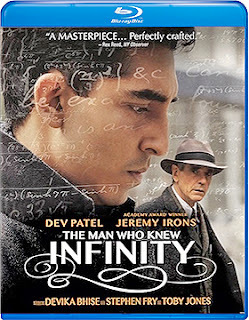 The Man Who Knew Infinity is a great story and fascinating in the take on who these two men were. Just to give you some idea of how crazy smart Ramanujan was, he could look at a number and tell you if there were two cubed numbers that might be in the number in question — i.e. 1x1x1 plus 2x2x2 — and then tell you if there was another combination of cubed numbers that also equaled the same product. The number of 1729, for example, is such a number, which just happened to be the number of a taxi that popped up in a conversation between Hardy and Ramanujan. Ramanujan, immediately knew that 13 + 123 equals 1729 … and so does 93 + 103. Do that off the top of your head! 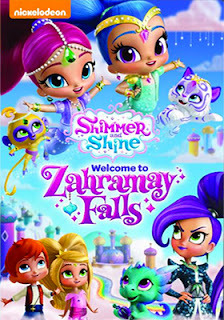 In other release news this week from Paramount Home Media, Aug. 16 marks the DVD The title of this latest group of animated adventures featuring fraternal twins — Shimmer and Shine, who just happen to be genies — is Shimmer and Shine: Welcome to Zahramay Falls. release of the next collection of Nickelodeon’s popular Shimmer and Shine animated adventures. Documentary producer and filmmaker Robert Mugge’s Mug-Shot Productions will be teaming with MVD Entertainment Group on Friday, July 22 for the release of a newly restored HD edition of his 1985 film, The Return of Rubén Blades. MVD will be handling the Blu-ray’s sales and distribution aspects in the domestic market. 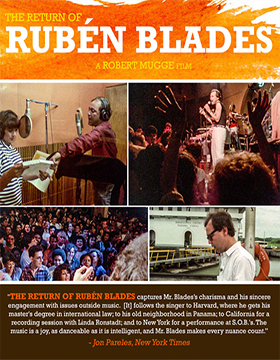 The film combines extended sessions with Rubén Blades — whose stunning career has ranged from that of a recording artist (Grammy-winner), a songwriter, an actor (currently starring in Fear the Walking Dead television series) and Panamanian political activist (serving as Minister of Tourism of Panama from 2004 through 2009 and he even ran for President of Panama in 1994) — plus Mugge blends in seven concert numbers (“Buscando America,” “Pedro Navaja,” “Tiburon,” “Silencios,” “Muevete,” “Todos Vuelven” and “Mack The Knife”). This long-await Blu-ray edition was transferred from the original 16mm film elements. It comes as no surprise that Walt Disney Studios Home Entertainment has selected a post-Labor Day window for the release of a three-SKU helping of the directing team of Anthony and Joe Russo’s smash hit, Captain America: Civil War. The Sept. 13 street date fits perfectly for a film of this caliber — no reason to waste a retail opportunity by dumping it during the doldrums of late summer. Wait until after Labor Day. The ARR works out 130 days and domestic ticket sales sparkled with $403.9 million generated thus far. What does come as something of a surprise — just a mild surprise, since nothing at Disney these days arrives with much in the way of shock and awe value — is that the studio is steadfastly holding to no 4K Ultra HD product offerings. 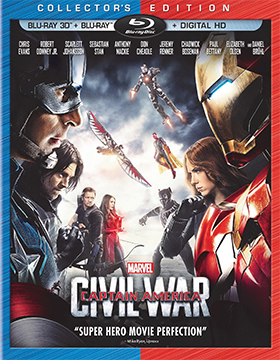 As to what consumers will be able to sort through on Sept. 13, there will be a stand-alone DVD edition, a Blu-ray SKU (Disney has quietly lowered the price from $39.98 to $32.98 for new Blu-ray releases) and a “Collector’s Edition,” which features both 3D and 2D viewing options (the price premium is seven bucks). What can go wrong with a major motion picture release when the cast is headed by Julia Roberts and George Clooney and the director is Jodie Foster? Nothing, unless the script is overly complicated — unrealistic by having too many moving pieces — and ultimately unsatisfying in its denouncement. 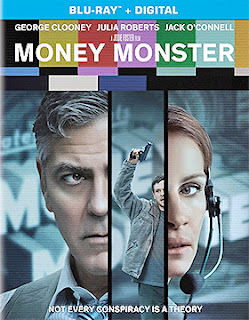 Other than that, Money Monster, which will be making its way to DVD and Blu-ray on Sept. 6 courtesy of Sony Pictures Home Entertainment, is a well-produced and fast-paced thriller … clocking in at a fast-paced 98 minutes. The film pulled in $40.5 million during its domestic theatrical release and arrives as Sony Pictures first post-Labor theatrical release with an ARR of 116 days. The Angry Birds Movie should be close on its heels as its second post-Labor Day major theatrical release. The reason for the trading “glitch” that sets things in motion, and the time that Clooney and friends have to solve the technical aspects of it, are just way too complicated. Simple would have been better, but still Clooney and Roberts do pull it off … and the film will likely finish in the black for the studio, especially with a nice home entertainment payout added to the mix.